Singapore Kid's Places: Are you excited? Formula 1 is here! Are you excited? Formula 1 is here! It is the weekend of the Formula 1 Night Race and Singapore has been gearing up for it (sorry about the pun). The trials begin tonight, and of course it means road closures and disruption for downtown Singapore as the race passes landmarks such as St. Andrews Cathedral, Esplanade bridge and City Hall. All the cheaper tickets are sold out; a walkabout ticket would be the best fun I think, so the cheapest ticket available at time of writing is S$598. Of course tickets prices escalate to above $3000. Many shops, restaurants, bars and attractions around Singapore have special deals for ticket holders. As well as lots of entertainment at areas around the circuit, some amazing entertainment has been scheduled over the three days for the F1 ROCKS concerts at Fort Canning Park, which is being hosted by actress Lindsay Lohan. 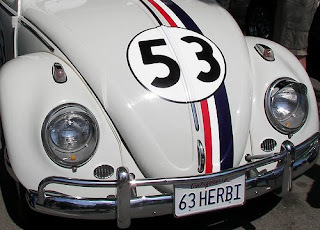 I guess she is a good match, having starred in film Herbie: Fully Loaded in 2005, a film about a racing Volkswagen Beetle. The F1 ROCKS concert performers will include Beyonce, Black Eyed Peas, No Doubt, Z Z Top, Simple Minds and Jacky Cheung. Now that I have spelt out all that entertainment I wish I had a ticket, but unfortunately I am staying away from the excitement and the noise. It may be sad to say, but I can't get excited about the glamour and hype of the Formula 1. The fact is the cars would zoom past me in a flash of colour, visible for a nano-second before disappearing around a bend but leaving me deaf for a while. If I do watch the race it will be from the comfort of my living room where I will have front row seats, a glass of wine, and the volume turned down! Hahah I'm totally looking forward to it, although I gotta say, I hated going home after the race. Felt like choke-fest last year! Singapore F1 GP was great ! Went to their Friday Practice ! My 2nd time there, hope you all enjoy it too !